Al-Shabaab’s stunning attack in the bustling Mecca-Al Mukarama Street, the main artery of Somalia’s capital, Mogadishu, on February 28, carry a crucial and important message to Somalia and the International Community. President Mohamed Abdullahi Farmaajoand Prime Minister Hassan Ali Kheyre have failed to lead Somalia, and the country is heading in the wrong direction. Since Farmaajo and Kheyre came to power in 2017, Al Shabaab has been emboldened by weak and corrupt government and they have increased potency and frequency of deadly attacks. According to senior Somali government officials, despite rhetoric and carefully choreographed media blitzes, Farmaajo and Kheyre have not prioritized combating terrorism, and Fahad Yasin, the de facto president and Acting Director of the National Intelligence Agency (NISA) has worked to undermine efforts to defeat Al-Shabaab. The question many are asking is not whether Al-Shabaab has infiltrated the federal government but the extent of the infiltration and the damage. There is a consensus that Fahad Yasin, has been building a symbiotic relationship between NISA and Al-Shabaab. Fahad Yasin, the power to be in Mogadishu, a former member of violent extremist groups in Somalia was a close associate of Ahmed Godane, the late leader of Al-Shabaab and Mukhtar Robow during the reign of the Union of Islamic Courts (UIC) has strong links of Al-Shabaab leadership dating back to UIC reign in 2006. Soon after Farmaajo’s election, Fahad began dismantling security institutions he saw as a threat, replacing officials with “Yes Men”, who would execute his plan to inject Al-Shabaab’s Amniyat to NISA. Today, Amniyat are strong elements of NISA, according to Somali and western officials. Therefore, Somalia security is in peril with government institutions infiltrated by Al-Shabaab, facilitating attacks and working against efforts to secure and stabilize the capital. What is stunning about Al Shabaab’s recent attack was the time the Mecca- Al Mukarama attack was carried out, which was after the sunset, at around 9 pm, at night, which is an heard of from the time when the terrorist group came to its existence in Somalia. This recent deadly attack shows Al Shabaab’s growing presence in Mogadishu and the ease they can conduct attacks in the capital. If that was not enough! What was also striking is that, a day later on March 1st, Al Shabaab fired motors targeting Somalia’s presidential palace in Mogadishu. The Farmaajo – Kheyre failure has been increasingly obvious since they assumed power over the more corrupt Hassan Sheikh Mohamud. Somalia elected the assumed less corrupt and competent president, dismissing a president though corrupt, who did not allow Al-Shabaab to infiltrate state institutions, and achieved more in his first two years. “I believe that neither Farmaajo nor Kheyre have the wisdom, vision, or intent” to lead Somalia forward, says a senior western diplomat, calling the pair dangerous, incompetent and fraud. So how did Farmaajo and Kheyre get to this point? After two years at the helm, the question many are asking is whether Somalia can be saved from dangerous, disastrous and corrupt Farmaajo – Kheyre government. Farmaajo and Kheyre’s relationship appears to have collapsed under the weight of Kheyre’s ambition to run for president in the upcoming election, mistrust, Farmaajo’s weakness, poor leadership and collapsed security, as well as Kheyre’s incompetence, narcissism, and arrogance. Kheyre privately confided to friends and allies that he has no confidence in Farmaajo and Fahad Yasin, and has more than $50 million he can use to oust them, and he is working to line up local, regional and international support, according to western diplomats. When Farmaajo took power in Somalia, financed by Qatar through Fahad’s web of network, he was celebrated at home and in the West as new kind of leader. He was a new generation and not former warlord, but was western educated. A break from Hassan Sheikh who many in Somalia and the West described as the corrupt president, whose family vastly enriched themselves during his tenure. Compere to Farmaajo, Hassan Sheikh now emerges as a crafty and wise leader who established much of Somalia’s regional States that includes Southwest, Jubaland, Galmudug and Hirshabelle regions, holding together a complex and unstable country, presiding over peaceful transition of power to a new government. Farmaajo failure has been obvious. Somalia is worse off today than two years ago. He is isolated due to his naivety and hubris, that is not based on reality, alienating traditional friends and allies of Somalia, leaving a government that is isolated and broke and can not support itself. Farmaajo sphere of influence has shrunk, and he has become lapdog boys to Fahad Yasin, and Ethiopia, according to officials. Somalia is failing because of Farmaajo’s weakness, naivety, impulsiveness, and instability as well as Kheyre’s self-love, incompetence, corruption and arrogance, according to western diplomats who routinely interact with him. They assess that Farmaajo is living in parallel universe (while Kheyre is suffering from a full case of narcissism- self love that fuels his arrogance,he uses to hide his hypocrisy, corruption, incompetence and lack of intellectual rigor. Frustrated diplomats regularly describe Farmaajo as erratic, unstable, spontaneous, and prone to making rush decisions without consulting with state institutions, and later blaming them for his failures. Others describe often-bizarre meetings with Farmaajo that served no purpose. Senior officials who have routinely interacted with Kheyre see him as an incompetent and weak micromanager who uses arrogance and fake nationalism to cover for his unfamiliarity with the basics of running a government. As a result, Somalia’s relationship with the United Nations, European Union, United States, United Kingdom, the African Union, as well as Saudi Arabia, UAE, Egypt, Kenya, Djibouti, and Uganda, have deteriorated from a warm start to suspicions and hostility over the course of Farmaajo – Kheyre term. Farmaajo poorly miscalculated the Gulf crisis and he is paying the diplomatic price now. He was humiliated by Qatar after a nation he stood by amid the Gulf Crisis decided to provide only ($20 million) for the year. According to reports, since the start of the Gulf Crisis, Qatar has invested $5 billion in Ethiopia, financing ambitious dam project. Qatar has also invested ($4 billion) in a port project in Sudan. Qatar donated over $400 million to Hamas supporting them in Gaza and continues to pay salaries and benefits of Palestinian government, spending hundreds of millions of dollars to support reconstruction and development in Gaza. Qatar donated $500 million to support Jordan. Finally, Qatar came to the rescue of Turkey during the financial crisis, spending over $15 billion to support the Lira and spent $5 billion in Turkish economy. Farmaajo and Kheyre between them traveled to Doha five times, and so far received 30 old city buses, old military equipment, a promise to build roads, and about $20 million, highlighting the pairs poor diplomacy and understanding on how to leverage Somalia’s unique value to competing sides of the Gulf crisis. What is also clear from Qatar’s $20 million donation is how disastrous the decision to align Somalia with a pariah State of Qatar was and will go down as a monumental miscalculation by Farmaajo that will continue to negatively impacted the future of Somalia. Souring diplomatic relations has pushed Farmaajo to seek ties with Russia, China and Iran, according to Western diplomats. The government is broke and has no money. The government has failed to pay the salary of employees, including the security forces for the past three months, and is desperately seeking support. President Farmaajo and Prime Minister Kheyre are polarizing, divisive, incompetent, corrupt, and tyrannical politicians who has lost the trust and the confidence of the nation. They are not capable of leading Somalia. Many blame Fahad Yasin for the pair’s turmoil. Fahad is responsible for many of problems since he is the de-facto president, however, Farmaajo and Kheyre should shoulder bulk of the blame for the poor state of affairs. 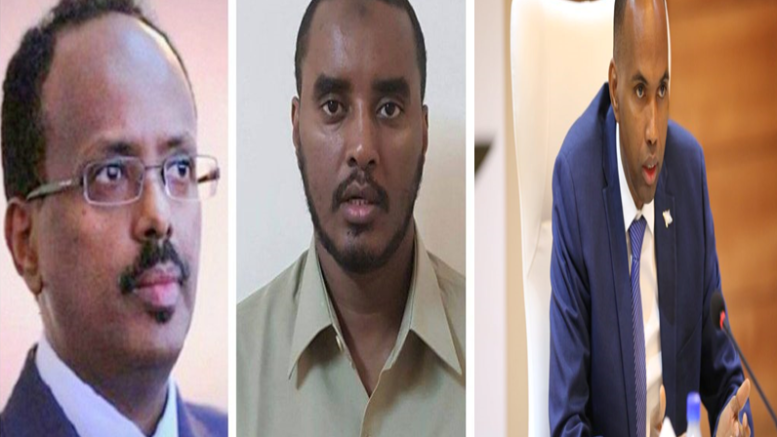 They are the elected and selected leaders of Somalia and not Fahad, so the buck stops with them.